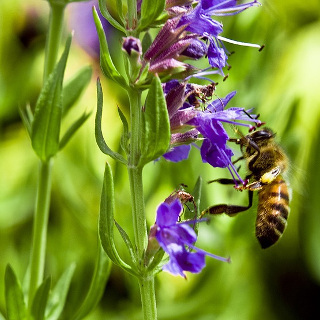 Hyssop is a favourite nectar source for bees and can be planted around beehives for a rich and aromatic honey. Repels cabbage white butterflies, cabbage moth and slugs. The leaves of hyssop can also be used as a culinary herb in moderation, they have a bitter, intense mint flavour. 11-13 weeks to flowering. 250 seeds per packet. Hyssop is a bushy perennial flowering herb that grows to about half a metre tall. Hyssop is native to parts of Southern Europe and the Middle East. Hyssop can be grown as a flowering ornamental in boarder gardens and rockeries. It produces blue flower spikes that are a nectar source for beneficial insect predators and pollinators. Hyssop is a well regarded bee plant, its leaves were even traditionally rubbed on new bee hives as its scent was thought to prevent bees from abandoning their hive and making a new nest elsewhere. Honey collected from bees that have been foraging on Hyssop flowers will have a strong and aromatic flavour. Hyssop makes a good companion plant for brassicas and lettuces as its scent repels slugs, cabbage moths and cabbage butterflies which like to feast on them. Hyssop is also a good companion plant for grape vines as it's thought to stimulate their growth. Hyssop leaves can be used as a culinary herb but they have a strong, bitter minty flavour so should be used sparingly. A fews young leaves chopped finely can add flavour to salads, stews or soups. Hyssop leaves can be used to flavour liqueurs and are an ingredient in Chartreuse. Hyssop leaves are used in herbal medicine to relive coughs and sore throat. Dried hyssop leaves can be hung up in cupboards and used as an air freshener. Hyssop will grow best in full sun but will also tolerate light shade. Hyssop needs a freely draining soil, growing it in a sandy loam is ideal. Grow Hyssop in raised garden beds if your soil is too compacted or heavy with clay. Dig through organic matter prior to sowing to improve soil health and structure. Hyssop is suitable for growing in containers but has long roots so choose a deep pot. Hyssop grows well in poor soils so don't overfertilise it, apply a complete organic fertiliser as required only if nutrient deficiencies are apparent. Hyssop is drought tolerant once established, don't overwater it or you may cause root rot. Mulch around Hyssop plants to suppress weeds and keep their root system cool. Hyssop prefers growing in a neutral soil with a pH range between 6.5 and 7.5. Hyssop grows well from cuttings or division of clumps. Prune bushes back by about a third after flowering to maintain a compact shape. For best results sow Hyssop from October to February in cold and mountainous regions of Australia. In temperate regions of Australia sow Hyssop from September to January. In subtropical regions you can sow Hyssop from August to November or from March to April. The dampness of tropical regions may provide a challenge but you can grow Hyssop there as a short-lived perennial by sowing it during the dry season from April to July. Sow Hyssop seeds 5mm deep spacing plantings about 25cm apart to give them room to grow. Germination of most Hyssop seeds will occur within 10 to 20 days. Hyssop will flower quickly, taking between 11 and 13 weeks when grown in ideal conditions.